"Hong Kong Noir digs below the financial centre's gleaming surface to unearth stories of the city's ghosts and spirits...The stories touch on major points in Hong Kong modern history: the horrors of Japanese occupation, post-war poverty, the economic boom under the British, the city's return to Chinese sovereignty, and the tensions of the 2014 'umbrella movement' occupation of key thoroughfares by pro-democracy activists. What better way to tie together the present and the past--the living and the dead--than through ghost stories?" "The history of Hong Kong, once a fishing village, encompasses piracy, the opium trade, prostitution, corruption, espionage and revolutionary plots; grist for the 14 dark tales in Hong Kong Noir." 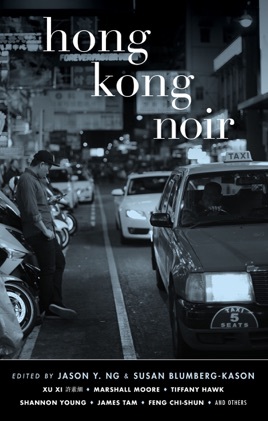 "Hong Kong Noir is a panorama of the city in its multiplicity of forms, from lush mountains in country parks, to the concrete jungles of shops and tenements, to the upscale luxury apartments in secluded coves...Ultimately, it is the memories of Hong Kong's human and otherworldly terrain, as portrayed by these varied narratives, that proves so beautifully haunting." "Crime fiction has to work hard to compete in a city where dismembered bodies make conspicuous appearances in news headlines...The result is natives and expats mingle with returning Cantonese and displaced mainlanders, each (often correctly) suspicious of the others' motives...As far as the city itself is concerned, this collection represents Hong Kong to its very core." "Now in the 14th year of its Noir series--which has collected original stories from Brooklyn to Istanbul to Lagos--Akashic has assembled a delightfully dark collection of fiction from Hong Kong, a city where talk is cheap and cash is still king." "Ng and Blumberg-Kason defy the fates by presenting a collection of 14 stores--by Chinese tradition, an ominous number--illustrating their city's dark side...Ng and Blumberg-Kason's Hong Kong is a city on the brink, haunted by its past but facing an uncertain future. Readers can feel lucky to have such a collection." Akashic Books continues its award-winning series of original noir anthologies, launched in 2004 with Brooklyn Noir. Each book comprises all new stories, each one set in a distinct neighborhood or location within the respective city. In Hong Kong Noir, fourteen of the city's finest authors explore the dark heart of the Pearl of the Orient in haunting stories of depravity and despair. What will Hong Kong look like in five years, ten years, or thirty years--when the "one country, two systems" promise expires? It's impossible to foresee. Hong Kong's future may not be within our control, but some things are. We can continue to write about our beloved city and work our hardest to preserve it in words. When we asked our contributors to write their noir stories, we didn't give them specific content guidelines other than to make sure their stories end on a dark note. What we received was a brilliant collection of ghost stories, murder mysteries, domestic dramas, cops-and-robbers tales, and historical thrillers that capture Hong Kong in all its dark glory. The result is every bit as eclectic, quirky, and delightful as the city they write about.